Preview the signup process for Dropbox Business and make sure your existing data goes to the right place. To join your team, you'll need to ask your admin to send you an invitation email. 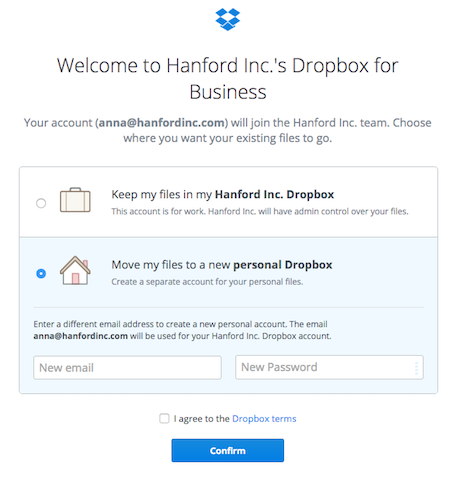 Once you're invited, we'll help you set up a new account and/or manage any existing Dropbox accounts you may have. Business accounts are managed and owned by your admin. If the invitation is sent to your personal email address, ask your admin to resend the invite to your work email address before continuing. Optional: After creating a work account, connect a personal account to separate your personal and work stuff. Personal and work accounts require different email addresses. Welcome! We're excited to get you started with Dropbox. Follow these steps to create your work account. If you want, you can create a separate account for personal files along the way. 1. Click the link in the invitation email and you'll be taken to our website. 2. Click "Join your team". Set up your work Dropbox by filling in your name and creating a password. 3. Click the blue button, and your Dropbox Business account will be created! From there, click "Get started" to learn how to access Dropbox on all your devices. 4. Optional: Set up a personal Dropbox. If you’re not ready, click "No, thanks. I’ll do this later." at the the bottom of the screen. If you already have a personal Dropbox account, click the blue sign in link. 5. You're all set! Go to the Set up your Dropbox section to learn how to start using your account. You'll need an email address separate from the one you used for your team account. Your personal Dropbox will be separate from your work one, and your admin cannot access it. If you aren’t ready to set up a personal Dropbox, click "No, thanks. I’ll do this later." You’ll still be able to move stuff to a personal account later, if you wish. Great! Before you join Dropbox Business, let's make sure you get your existing files where they need to be. Every Dropbox account is linked to an email address in order to verify your identity and send you notifications about your account. 1. Check your email for the invite to join your team’s Dropbox Business account, and click the "Join your team" button in the email. 2. If necessary, sign in with your username and password. A) If your files are mostly work-related, select Keep my files in my [business Dropbox], and then click Confirm. All of the files currently in your Dropbox will migrate to your Dropbox Business account, and you’ll be able to access them by downloading the Dropbox desktop app or by visiting the Dropbox website. Enter a different email address and password for your new personal Dropbox. Agree to the Dropbox terms, and click Confirm. If necessary, verify your email address (check the inbox of the new email you provided and click the button in the email). All of the files currently in your Dropbox will migrate to your personal Dropbox account, and you’ll be able to access them by downloading the Dropbox desktop app or by visiting the Dropbox website. No need to worry: let's figure out which email address your account is associated with before you join Dropbox Business. 1. If you don't remember your login information, try resetting your password. You'll receive an error message if no account with that email address exists. Try a different email address if this doesn't work. 2. Once successful, check your email to continue with the password reset process and sign in to your account. 3. Now that you know whether or not you have a Dropbox account, you can join your team's account. Just follow the steps above!